First leaked image of the new Zeiss Ventum Lens series…for Z-mount? Skylum officially launched Luminar 3 with Libraries (Click here). You can preorder it today with a $10 discount using our code “MIRROR“. The software will be made available for download on December 18. If you proerder within that date you get many bonuses on top of it. Luminar 3 includes the highly anticipated Library module that will make it work similar to Lightroom. 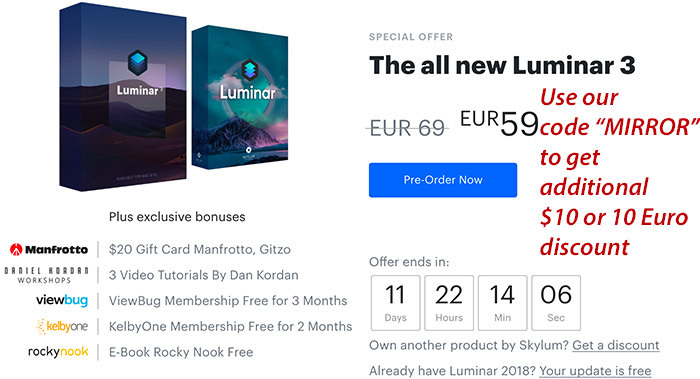 ● New users can purchase Luminar for US$59 ( US$49 with coupon code “MIRROR“). ● Current users of Luminar 2017 can upgrade for US$49 ( US$39 with coupon code “MIRROR“). Note that the price after the Luminar 3 with Libraries release will be US$69. 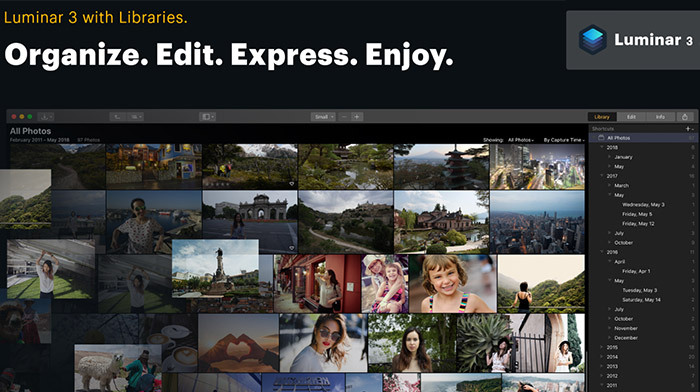 The new library panel turns the acclaimed photo editor into a one-stop imaging solution, allowing amateur and pro photographers to intuitively import, organize, edit and publish images with unprecedented ease and efficiency. BELLEVUE, WA – December 6, 2018 — Today, Skylum Software announced the availability of the next version of Luminar, their award-winning photo editor. Luminar 3 will start shipping to customers on December 18 and adds the ability to organize and edit multiple images simultaneously with the new Library panel. This addition transforms the photo editing software into a comprehensive, all-in-one imaging package. Luminar 3 is a sophisticated image editor and library, which uses artificial intelligence to allow anybody, working with digital images to make better photos with intuitive and time-saving workflows. Luminar 3 makes processing, managing and editing photographs quicker and easier than with conventional software packages. “This has been a long-anticipated update as our users were keen on a fast library function that works with their existing folders. We never replicate what’s already on the market, but look for new approaches to make our app as fast and easy to use as possible. And this is only the first of many far-reaching updates, so stay tuned.” says Alex Tsepko, CEO of Skylum. The new Library panel is the result of years’ of research, analysis and interviews with a wide range of photographers. Skylum optimized the Library panel for speed and efficiency, responding to long-standing complaints by photographers that existing library options were cumbersome, cluttered, or impractical. Photographs are also automatically organized by capture date— all features that make it quick and efficient to find and sort images. Changes are made in real time in the original folder, keeping files and the hard drive organized as effortlessly as possible. Luminar 3 also allows photographers to sync their editing adjustments. Any change made to a single image can easily be applied to a selection of files, which is useful for photos taken in similar settings or when a uniform style is desired. Syncing works extremely well thanks to Skylum’s unique Accent AI and AI Sky Enhancer filters which use artificial intelligence to analyze and fix image problems. With these features, a number of images can be adjusted simultaneously, saving the photographer time and effort. The new Luminar 3 will be available as a free update for all the users of Luminar 2018 and will include multiple free updates as we built out a fuller set of photo management tools and more time saving artificial intelligence features. More information about future update is available at https://skylum.com/luminar/roadmap. Skylum is the company behind the pioneering Luminar software. With over 1,5 million downloads, the company is rapidly establishing itself as a major player in the photo industry. Luminar’s intuitive interface and affordable cost, has put high-end RAW processing and image editing tools, driven by artificial intelligence, at the fingertips of busy professional and enthusiast photographers alike. The software allows users to edit images by using traditional tools, such as curves, clarity, and dehaze as well as via adaptive Luminar Looks or unique AI-powered tools. • Luminar ‘Workspaces’ streamline editing by offering recommended filters that are ideal for a chosen genre, including landscapes, portraits, aerial and portrait photography. • Luminar developed ‘Luminar Looks’ – the next generation of adaptive styles to include LUTs, textures and AI-powered filters. With one-click a new style is applied, but simple and advanced controls make it possible for nuanced adjustments. • Luminar perfected over 50 filters, including its revolutionary AI Sky Enhancer, which uses artificial intelligence to select the sky automatically for precise adjustment. With just one slider the perfect look can be achieved. Other innovative filters are Accent AI and the Sunrays filter, which can be used to add sunshine selectively. Mixed-computer households can share the same product key for Mac and PC which can be activated on 5 devices. award by TIPA and “Best Software Plugin” in October 2017 by the Lucie Technical Awards. To learn more about Skylum, please visit http://skylum.com/.